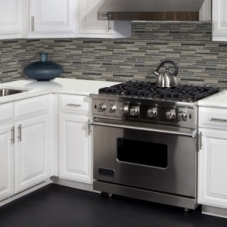 When it comes to eco friendly building materials, Arizona Tile and Glass has been a natural choice since 1977! Polished and honed stone has been thoughtfully sourced, while their durable porcelain, and industrial strength 8mm thick glass tiles are often composed of a high percentage of pre-consumer and post-consumer recycled content. Arizona Glass Tiles offer timeless beauty that withstands the high traffic demands of interior commercial and residential settings. And because stone and glass are so resilient to frost and extreme weather conditions, Arizona Glass Tiles are perfect for outdoor applications as well! Ecological benefits, aside, even if you are more focused on the look of your new home than actually building your own green house to grow organic crops in, with Arizona Glass Tile you will be the talk of the town! But if you really want to earn some great karma points, we think that paving your walkways to your greenhouse in something from Arizona Tile’s Skylights Melange collection would be ultra awesome! 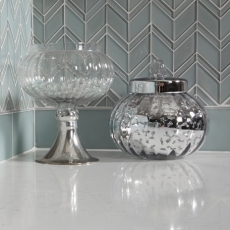 The Reflections line offers opalescent mosaics for a fresh take on a classic tile look. 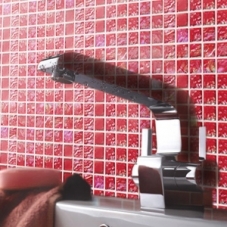 The Skylights collection features deeply saturated opaque glass tiles in a variety of dimensions. Skylights II brings additional boldness to the party with some high drama staggered tiles and a unique color pallet. Skylights Melange really mixes it up with stone and glass mosaics. 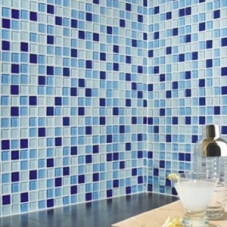 Soho is just the sleekest and sexiest look in tile we have seen in a long time. Who knows which lines from Arizona Glass Tile will inspire you? 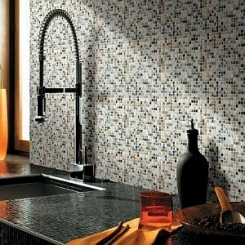 We at Ecomoso hope you enjoy browsing the abundant selection of looks Arizona Glass Tile has as much as we have!